Of all the beef stew recipes I have tried, this one is without a doubt one of my favorites. It slow cooks all day in the crock pot, and the moment you walk in the house you can't wait to get a bowl of it. The secret in my opinion is to brown the meat to give it texture before placing in the crock pot, and to saute' the onions to bring out their sweetness. While these steps take a little more time, I think it is worth it. Subscribe to "The BBQ Gazette"
3 to 4 lbs of beef chuck roast, cubed. Fuzzy's Steak Rub and Kicker. Other steak rubs will do, but not as well as Fuzzy's! 1 large onion, chopped and sautee'd with a teaspoon of chopped garlic. 4 large carrots, peeled and cut into 1/2 inch pieces. 4 potatoes, cleaned and cubed. 2 regular cans of diced tomatoes. 1 1/2 cups of a nice red wine. Simply combine all ingredients in a crock pot and cook on low for 8 hours. Remove the bay leaves and (at your discretion) use a little corn starch and water to further thicken before serving. 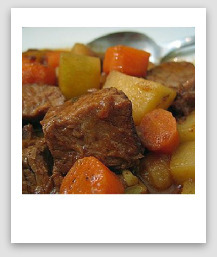 Leave Beef Stew Recipes and Return to BBQ My Way Homepage.